The Paris Agreement makes it plain: We need to change the world, and fast. Our cities and communities—and the systems that power, connect, and supply them with essential services—desperately need a 21st-century overhaul. We’ll need to replace a great deal of existing outdated infrastructure with smart, innovative, intelligent systems. These systems will produce far less carbon and not only anticipate climate-related impacts, but also bounce back from them—and even “learn” from them. Cities will need to accommodate more people, while improving quality of life for residents. And they’ll need to be connected via efficient, comfortable, and clean transportation networks. How will we finance this transformation? How will investment, industry, and government leaders collaborate? Which jurisdictions are already making it happen? 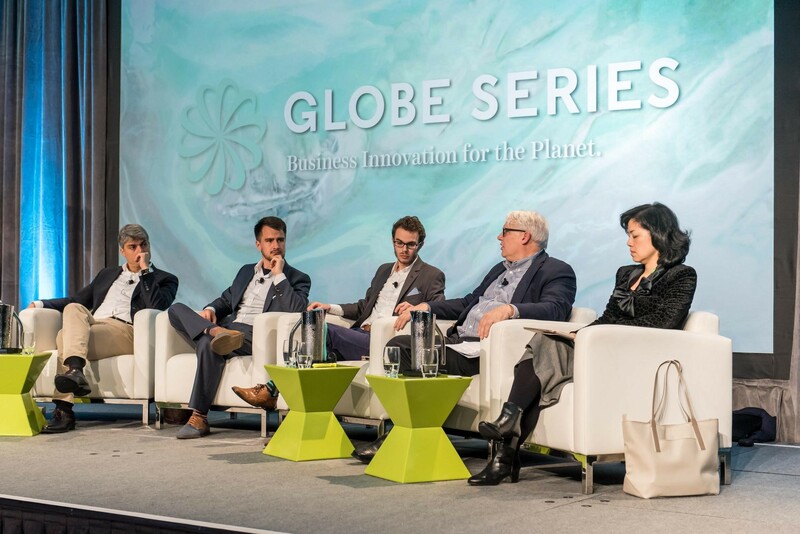 Those questions lie at the heart of GLOBE Capital 2017—a new leadership event offered by GLOBE Series, coming to Toronto, Canada from April 3-5, 2017. In anticipation of GLOBE Capital 2017, we placed a special focus on finance and investment at GLOBE 2016. A variety of sessions addressed such subjects as finance innovation for scalable, global technology deployment, green economic development, financial inclusion and fiscal reform, and carbon risk. Here, a few key observations from a pair of related sessions. Carbon Tracker Initiative founder and executive director Mark Campanale speaks while Jackie Forrest, vice president, energy research at ARC Financial, looks on. Recent science suggests that the lion’s share of fossil reserves must stay in the ground if the earth is to keep below two degrees of warming. How are investors and pension fund managers responding to the potential for stranded assets? Carbon Tracker Initiative founder and executive director Mark Campanale said that the real risk that investors see today is not clean energy, it’s actually the fossil fuel sector. At Suncor’s recent Annual General Meeting, Campanale noted that shareholders tabled a resolution requiring the company to explain how it will adjust its production forecast to remain viable in a 2C world. Saudi Arabia is resisting supply cuts, noted Campanale: “They want to be the last provider of oil.” He said that the kingdom wants to see decline in new investment in shale and oil sands. Oil companies could become more valuable by managing their own downsizing, getting “smaller, more focused, more disciplined,” said Campanale. They could use capital to make more money on every barrel, rather than seeking new ones. The downturn has killed new investment, said Jackie Forrest, vice president for energy research at ARC Financial. “Demand (for oil) is growing” despite downturn, she said. In 2015 demand was “highest in five years.” There might be 300,000 electric vehicles sold this year" Forrest said, but there will still be 100-million-plus cars and light trucks sold that are powered by oil." Even under 450 ppm CO2 constraint scenario, we will need to bring 40 million barrels per day online between now and 2040 to keep up with depletion and hold supply flat, Forrest said. Forrest sees “limited stranded asset risk” over next 5-10 years. Only 10 percent of all emissions occur in oil production. She cited the ARC report, Crude Oil Investing in a Carbon Constrained World. The oil industry is not investing in new production, and that could be quite destabilizing, she said. Forrest suggested that the divestment movement is hypocritical, because it focuses only on industry and supply, and not on consumers and demand. Laura Nishikawa, the head of fixed income ESG Research at MSCI said the conversation about carbon budgets is moving “from the religious to the rational,” from activist demands etc. to business mainstream planning. Nishikawa sees a significant gap between what nations committed to in terms of GHG reductions at Paris, and what companies are planning for. There is lots of talk about divestment, but institutional investors are embracing more moderate approaches, she said. Example: Portfolio Decarbonization Coalition. 70 percent reductions in carbon exposure, 95 percent reductions in fossil fuel investments, but still perform as well as rest of the market. Karen Lockridge, the Principal, Sustainability and Climate Change & Pension Actuary at Mercer admitted that, four years ago, she was personally oblivious to climate change. She’s now working on “Investing in a Time of Climate Change” report, with managers representing more than $1 trillion assets under management. A 2C world might be insurable, Lockridge said, but a 4C world surely won’t be. Ed Whittingham, the executive director at the Pembina Institute, said the oil majors are now asking “What is our role?” regarding energy transition. Fossil fuels are still very profitable, he noted. Even very good renewable energy projects have only single-digit ROI. But past certain thresholds, market conditions change dramatically, Whittingham said. He cited the example of a UC Davis study, in which traffic congestion beyond a certain threshold leads to flatline in car ownership within a city. David Berliner, co-founder and CEO of crowd financing platform CoPower. This session explored strategies and solutions that would support a robust financial system for scalable, global technology deployment? What existing and new mechanisms can move large private sector capital from the “crowd”, as well as from large institutional investors like pension funds and sovereign wealth funds, to where it is needed in order to finance commercially viable enterprises and projects? Christian Häuselmann, co-founder, Swisscleantech & Global Cleantech Cluster Association (GCCA), moderated the discussion. Häuselmann’s organization launched in 2010 to bring together what is now a network of more than 50 cleantech clusters from around the world, representing more than 10,000 companies. 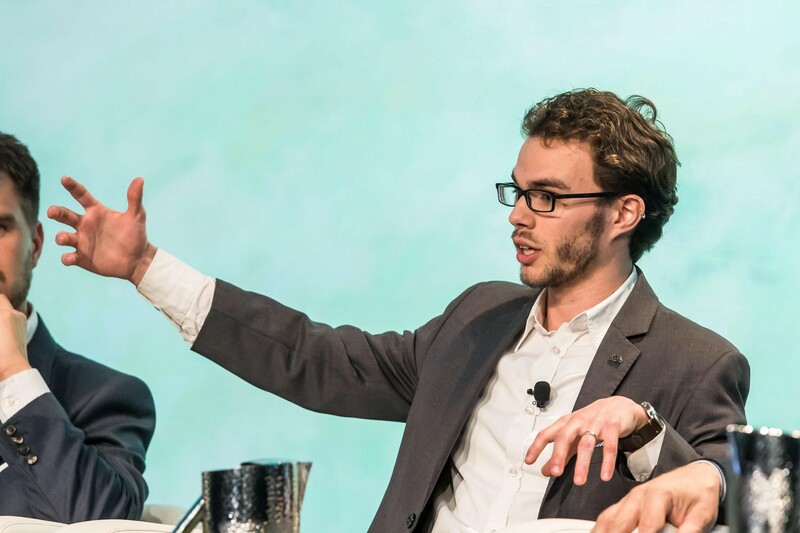 We need to attract trillions of additional investment to transition to clean energy economy, said David Berliner, co-founder and CEO of CoPower. Berliner said there are dozens of other distributed energy solutions that are ready for deployment: LEDs, geothermal, energy efficiency, heat and power, storage. They lack access to early project financing. Berliner said online tech enabled platforms like his CoPower can facilitate investors—including retail, individuals, family offices, and institutions) to make loans to these project for yield returns and green impact. The Finance Innovation for Scalable, Global Technology Deployment panel. From left to right, Samy Ben-Jaafar, Director, Private Sector Facility, Green Climate Fund, Markus Lampinen, the Founder & CEO of Crowd Valley, David Berliner CEO of CoPower, Roger Wagner, Senior Counsel, Dentons Corporate Group & Managing Director, P80 Group Foundation, Lih-Chyi Wen, Director and Research Fellow, CIER Center for Green Economy & Deputy Director, MOEA Green Trade Project Office. Samy Ben-Jaafar said that while cleantech solutions seem a good bet, we need to think about how to address, systematically, the risk issues with pension funds. Roger Wagner said it’s always been difficult to get pension funds to invest in clean energy due to a lack of diversification. If we can “fill the frame” of an infrastructure project, then more and more pension funds see infrastructure funds as a stable long term investment with relatively low risk and low potential for substitution. “When you get into technology, you have a tougher time because if the tech is not as well established or required development or has risk associated with it is not going to fit the low risk model that the pension funds are seeking,” Roger Wagner said. Having said that there are recent examples, the White House clean tech initiative in June, a new vehicle was promoted by the former head of the DOE’s loan guarantee program. Kensington takes institutional products and brings them down to individual accredited investors, high net worth, or family offices. “Standard and Poor’s and Moody’s have not built this risk into risk rating models. Cost of funding for companies that are highly exposed to climate change is being mispriced,” said Wagner. “Not one central bank governor and not one managing director of one of the ratings agencies is factoring climate impact risks into their ratings. It’s conspicuously obvious that they are missing from the party. It is time we demand that they show up to the party,” said Wagner.